When you come to Ecuador for about two weeks, we highly recommend to spend your journey in all 4 geographical regions and experience the most diversity of this beautiful country. You can start your trip in the Sierra region in Quito for instance, where you should visit some of the various must-sees in the City. Like the Panecillo, the street of the 7 Churches, the Basilica and the Plaza Grande in the historical centre. A good place to stay is the Hump Day Hostel. It is super centrally located, spacious, has breakfast included and you’ll always meet people from all over the world. More stunning nature however can be found in the surrounding areas of Quito. 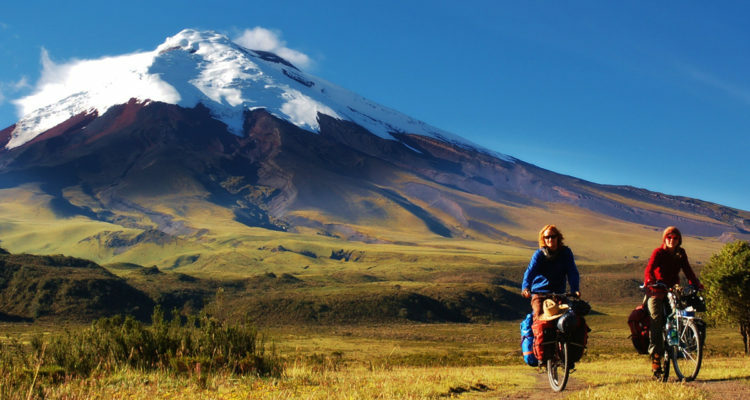 You can easily explore them by doing one of our day tours like visiting the Cotopaxi Volcano for example. It’s one of the world’s highest volcanoes and you can climb up to the glacier on 5000m before mountain biking down again. 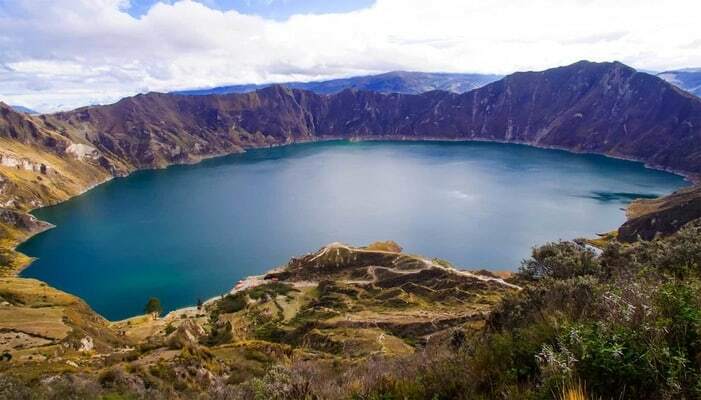 The Quilotoa crater lake is another highlight that you should not miss out when in Ecuador. It is a water filled volcano crater that you can reach after hiking down. As soon as you arrive down by the lake you can reward yourself with some kayaking before hiking back up again. You can also visit the biggest outdoor market in South America which is located just 2 hours outside of Quito: the Otavalo Market. There you can find plenty of souvenirs and goods ranging from leather perks to colourful Inca textiles. All sorts of fresh fruits, vegetables, breads and spices can be bought here for a cheap price. Furthermore, the cloud forest Mindo is also worth a visit. You can do a great walk along the waterfalls and zipline through the forest on your way back. Afterwards, you can do some relaxing activities, such as visiting the butterfly farm or and the chocolate factory where you can try some delicious Ecuadorian goodness. For your stay, we recommend the LaBicok Ecodloge. After visiting the cloud forest, you could head to the Amazon jungle, which is definitely one of Ecuador’s highlights. We recommend staying here for 4-5 days in the Nicky Lodge. You can explore the rainforest through several jungle walks, canoeing, swimming in the Largo Agrio and learning more about the diverse wildlife. You can also get the unique chance to meet some local indigenous communities here and to learn more about their traditions. In case you need a day to relax after your Amazon journey, we can highly recommend to head south for a day trip to Papallacta where you can relax in the thermal baths, hot springs and enjoy the views of the surrounding nature before you’re continuing your journey to Banos. Where you could stay at the Plantas y Blanco’s Hostel for instance. 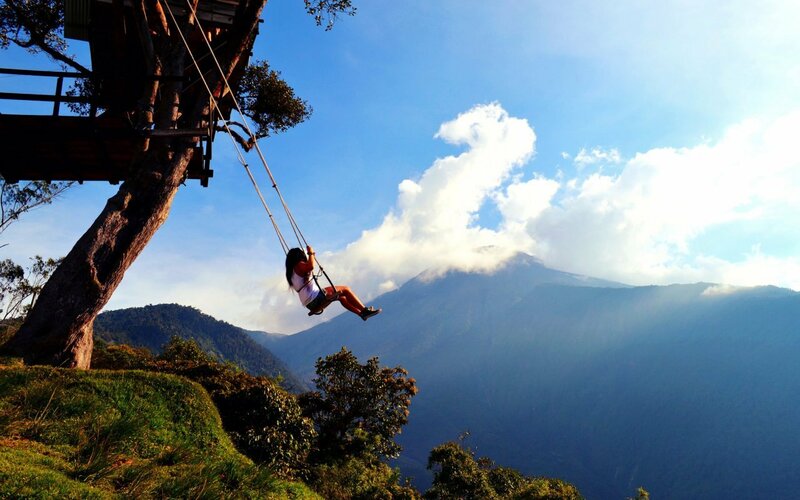 If you are looking for some adventures and party, Banos is the right place to visit next on your journey. Exciting activities, such as canyoning and rafting can be done here, but also a waterfall tour and the treehouse with a high-flying swing should not be missed. In the evening, there are many opportunities to party in one of the bars and to make new friends. After experiencing the Sierra Region and the Amazon area, it’s time to experience Ecuador’s coast, the so called ‘Route del sol’. 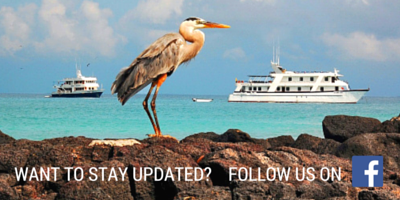 It’s a destination for all sun seekers and ocean lovers. 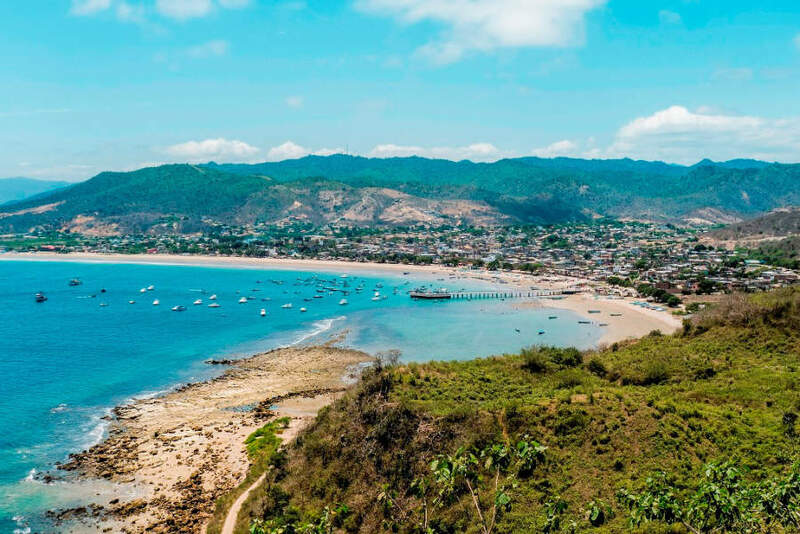 Puerto Lopez, Montañita and Salinas are one of the most popular places to soak in the sun, have a cocktail and eat some of the good Ecuadorian seafood. For your stay we can highly recommend the Esperanto Hostel. 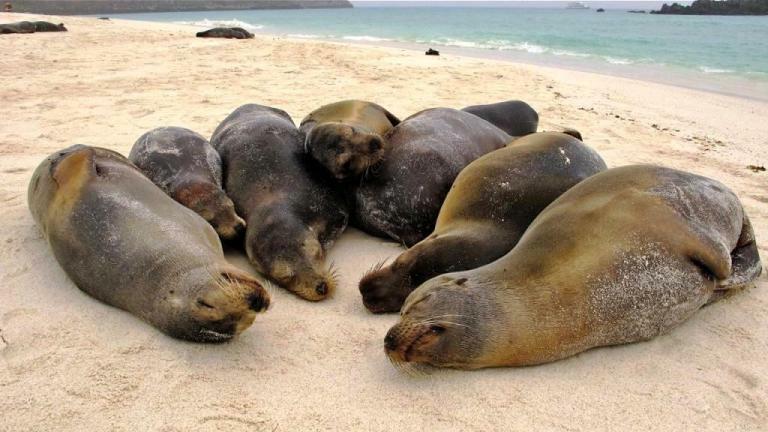 Finally, the best for last- the Galapagos Islands. The islands are the main attractions in Ecuador and one of the absolute highlights that you should definitely not miss out on. You can experience them by joining a cruise for 4-8 days or by backpacking and exploring them on your own. It is one of the rare places in the world, where you can swim next to sea turtles, dolphins, sea lions and see unique animals such as Iguanas that only can be found here. Amazing Animals you can see in Ecuador!